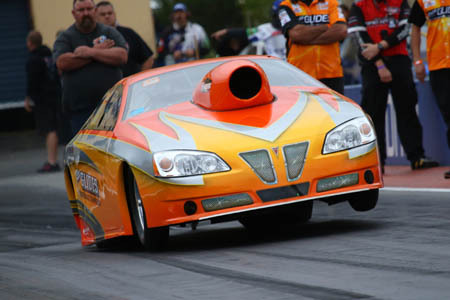 National Championship Drag Racing returns to Calder Park Raceway December 27 at the Rowe Memorial Super Stock Classic. The Rowe Memorial is the present day version of the Andrew Rowe Memorial previously held at Calder Park, honouring legendary Super Stock racer Andrew Rowe and his family. For Super Stock driver Hugo Digianvincenzo (Taylor's Lakes) it's an event close to his heart and one he will be trying just that little bit harder to win. "I knew Andrew Rowe personally, and his contribution to the category was pioneering," said Digianvincenzo. "To me, the Rowe Memorial represents a chance to celebrate his legacy - which is still strong today and will no doubt continue to be into the future. "Super Stock is a true racers category. So naturally, the event will be tough. That said nothing worth achieving is easy." Doubling as Round 6 of the Summit Racing Equipment Sportsman Series, the Rowe Memorial is the first National Championship event to be held at Calder Park since April 2014 and the first on the upgraded track surface. Digianvincenzo is relishing the prospect of attacking his newly refurbished home track and is confident a new National Record is within grasp. "I think it's great that Championship racing has returned to the southern states. Makes it easier for us to test close to home, and it paves the way for a definitive National Series. "We haven't raced on the track since the upgrade. But we did go to the Melbourne Jamboree. It's all looks top notch - 150%. "The car is capable of running on the record. We've pulled in some new team members, installed a new engine and while the car is still testing, we're feeling pretty confident. We hope to do well at the Rowe Memorial." Round 6 of the Summit Racing Equipment Sportsman Series will be held as part of the Rowe Memorial Super Stock Classic at Calder Park on Sunday December 27.